Not for the faint of stomach, either. 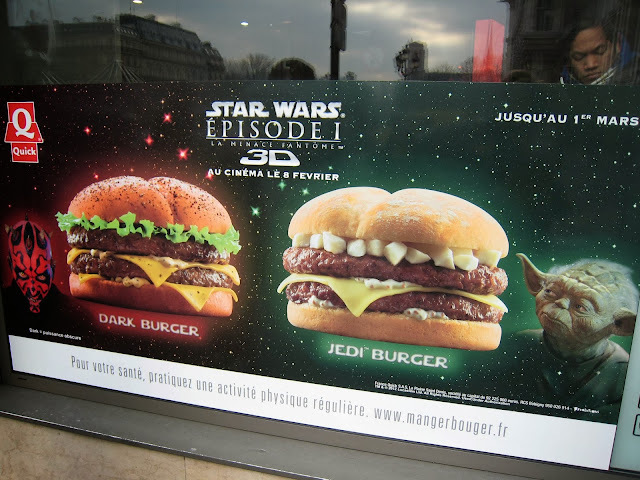 It is an ad for the "Dark Vador" burger (full menu 7,20€, or $10) which was available for a limited time only (March 2-5, a couple years ago) at Quick, a fast-food burger chain in France. Also on the menu: the Jedi Burger, which looks like it has either cheese curds or peeled apple chunks under the top bun. As yoda would say, "Burger so disgusting it looks, hard to believe French it is." It should be noted, however, that fast-food burgers are not such an anomaly in France, which is the second biggest market in the world, after the United States, for McDonald's -- familiarly called "MacDo" by the French. Just this past week, it was national news -- national good news -- when the first Burger King opened in Paris inside the Gare St. Lazare. There were enormous lines and crowds, and that's even given the fact that the opening had actually been announced for a day later, and the real opening was something of a surprise. Avez-vous vadé aujourd'hui? Have you "Vaded" today? If not, eat these frightening burgers! And may the Farts be with you. This is a supermarket sort of cheese, easy to find at the Monoprix, but also one with a long history. 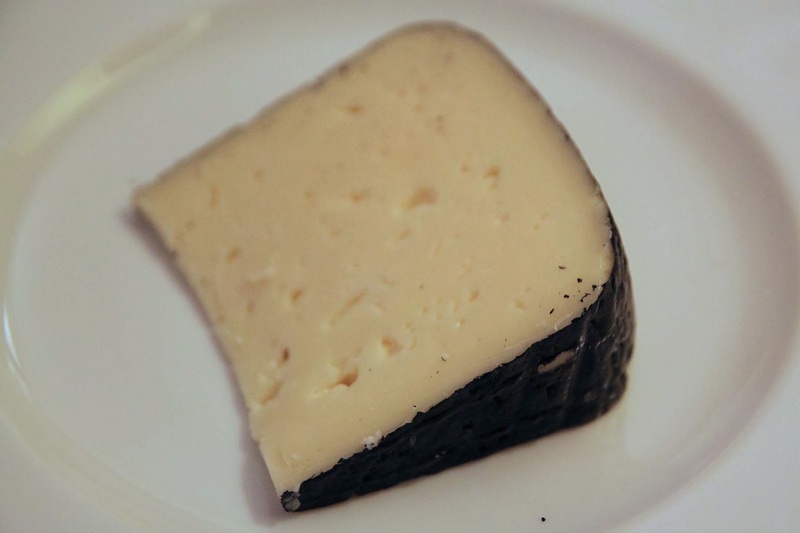 The first mentions of this cheese date back to the 12th century, when King Louis VI (nicknamed "the Fat" or more rarely, "the Battler", which I assume is the nickname he would have preferred) was recorded as having received a Tomme Noire des Pyrénées from noblemen while passing through the Pyrénées. It used to be made on the farm or cooperatively, specifically from milk collected when the cow's were in high pastureland in the summer, but now is an industrially made, pasteurized-cow's milk cheese. Tomme Noire des Pyrénées has an AOP designation since 1996, under the auspices of the IGP (Indication Géographique Protégée or Protected Geographic Indication), meaning while it's not got AOC status, it does ensure that all of the milk used comes from within the specific region. You don't get a rind this jet black just from natural mold. That comes from a very fine wax layer which is put on the cheese at the end of the affinage period of three weeks in order to block air and therefore stop the ripening process. After cutting off and discarding the waxy rind, you are left with a slightly hole-speckled cheese that is mild and only lightly stinky or sour. It's on the edge between rubbery and soft and melts nicely in the mouth. All in all, it reminds me very much of an Edam that you would buy in the US, and is a cheese that's hard to get too excited about but also hard to hate. It seems like something picky kids would like or that might work on a sandwich. The shiny jet black rind brings to mind Dark Vador's helmet. Or the fake bun in the Quick burger billboard. 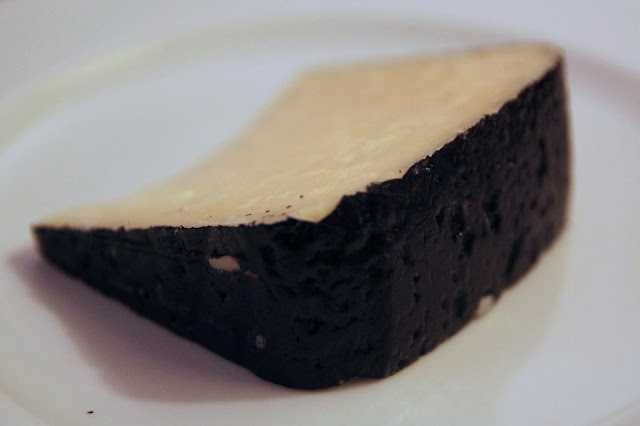 Though Tomme Noire des Pyrénées is not an evil cheese, it certainly has all outward appearances of having gone over to the dark side.